$325 for a harness?? wtf. I'm in the wrong line of work. I could be converting junkyard harnesses in 30 mins flat, and selling 'em for half that! Question: After repinning, will the ALDL signal be sent via pin E (like it was with the 746 stock), or is it sent via pin M like factory 730 cars do? I am under the impression that it will still be pin E right? I'm trying to track down an ALDL problem. WinALDL works on other cars with my 2 resistor cable and laptop, but I can't get TunerPro, DataMaster, or Craig Moates 852 software to connect with the 730. I'm starting to think its in my wiring. I can read error codes by jumping A and B. I've verified pin A is grounded. Can I use a voltmeter to safely check pins E and M? Really good info Joe!! Thanks!! I would go for it but I'm going TBI to MAF TPI. Anyone happen to have the re-pin charts for a 746 to 165 ECM? I also agree that re-pinning would be tons easier than running a new harness. I could do one, but why? Besides, arn't you boosted? The '749 would be a much better choice for you. I really would stay away from MAF. I spent a long time trying to tune maf. Went to SD and it was like instant relief. Yeah I hear you there. I do plan to do the 749 for my 91Z, and I really gotta thank everyone on the board for providing so much info about these swaps. The TBI to TPI swap that I wanna do is on my 89 RS. We pulled the L03 and intended to swap in a carb'd 350 and use the car on the track only. But then I found a different 84 chassis with a cage for super cheap with no papers, perfect track car. So we decided to put the 89 RS back together for my girlfriend and convert it to TPI with left over MAF TPI parts. Not gonna happen for a while though, I still gotta find some LB9 heads. Are there diagrams on the boards with the 165 pinouts? I know I should probably be doing searches instead of posting ... hehehe. With what you posted here I should be able to figgure it out. Thanks for your help Joe, I really appreciate it. Well.. if I have time i'll do a pinout conversion. LIttle tricky with the maf burnoff relays, etc. Isnt it harder to run a bigger cam with speed density than MAF? I read that its easier to swap a bigger cam in a MAF system than a Speed Density due to vacuum and computer adjust. problems?? So other than the knock sensor, what other sensors do we need to change out? I thought TBI guys needed to swap IAC, TPS and some other things. Is this a repin to keep the 7747 or what needs to be done to the existing 7730? Is a 730 a faster ecm? IAC, TPS will be on your new TB. What would be a neat setup is if someone would convert a carb intake to EFI like I did on mine, and try the TBI throttle body unit on it with the injector pods and such removed. I'd like to hear how that TB works in a dry setup. I went with the vortec TB on my setup, but I had to make an adapter to mount it. How well will a V6 harness from a 92 camaro translate into my car? Will this take all the hastle out of repinning things? Also im not familiar with IAC and TPS on Speed density (tpi) cars. Are they diff sensors than what are on TBI and I know their on the TB but do I need to buy new ones? The v6 harness would have to be converted to a v8. This how-to is the repinning of a harness. You would need a complete MPFI setup, either tpi, hsr, whatever . I did this swap over the summer for a friends car. Thats what I have for the pin outs. I corrected some of the wrong ones and added in the missing ones. That there "should" be the complete list. Also coming off the 747 harness from C8 the PSPS (Power Steering Pressure Switch) and C9 (Crank Signal) Aren't needed at all. Unless you want to add in the PSPS to the 730 and have the idle kick up a bit while you are turning. Last edited by Kat; 12-12-2004 at 12:55 PM. I went to the yard today and pulled 12 V6 injectors (19lb i believe), a V6 TPS and IAC and skipped the harness. Will these work for my TBI to TPI conversion. I plan on following your repin how-to since I have a 7730. I know that MAP can be reused and Ive bought a new 91-92 knock. Ill be using HSR for the setup and just get a 58mm TB. Anything else? Should I skip the 19# injectors and just buy a new set of 2_+# ones since ill be doing HSR on my 350. I thought maybe bump up PSI and compensate somehow on the 19# but im not sure. The IAC might not work. What "v6" injectors did you get... if they are 2.8/3.1 v6 injectors, they may not be enough. Quad-4 engines have a really nice injector harness I adapted to a TBI harness as well... just as a tip for those trying to piece together v6 wires. 92 did you ever find an answer to this??? I am getting ready to start this conversion with a stock l98 and HSR and I am planning buying an AUTOPROM. Only concern is after I repin is the ALDL going to be the same as a factory 730 ALDL??? If not can the AUTOPROM even work without modifiying it?!?!? Thanks. Hope it is helpful for you guys who know how to use them. Last edited by 92heritageRS; 04-06-2005 at 05:57 PM. I'm now about a week from starting this conversion. 3 Questions. 1) Did you guys pull the harness from the computer, or just do it inside the car? 2) Can you purchase the quad-4 harnesses new from GM, if so does anyone know the part# or price? 3) What A/C problems did you encounter because I've heard that is one of the only major circuit differences between TBI and TPI? I wonder if you stay with the TBI single fan what I would have to do? No clue, but I have a slew of used ones in good shape I'll send ya cheap. Shoot me a PM if you're intrested. I haven't gotten around to this yet on my conversion, but I'm planning on running another wire (along with some additional Sys. Grnd wires while I'm at it) for to let the ECM control the single fan (just like it controls the primary fan of a dual-fan TPI setup)... Should just be able to run a wire to the Negative coil feed on the fan relay, and wire that to GE8 (Cooling Fan Control)..
Last edited by thirdgen88; 01-19-2005 at 09:49 PM. Thats what I did. 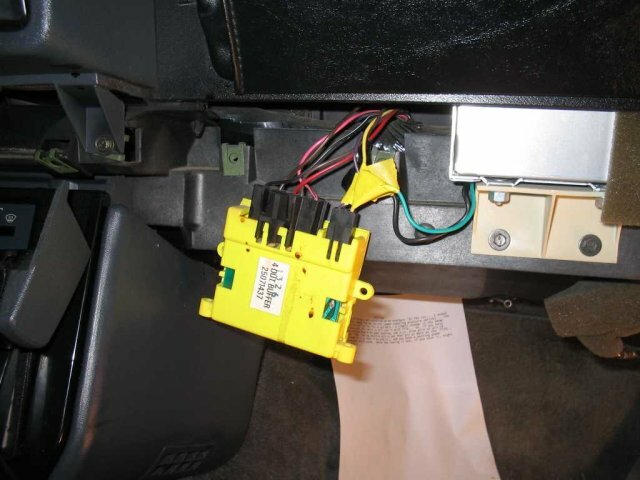 Actually I was lazy and ran it to the wire that went to the manual fan switch inside the car. Works quite well. I'm doing this swap actually w/ TPI now (HSR funds went south, heh). I'm hoping to try and document and take pictures. Probably start a new thread but hopefully it will help people out. Here is the definitive answer.. When I did the TBI -TPI swap on the 88 TA I used the original TBI rubber lines going to the TPI fuel lines. Okay, fired up the conversion today (and drove it home!)... Some notes for people doing this conversion... All went as planned except for the speedo... Initially I had no speedo input to the ECM (and hence no TCC lockup)... The speedometer on the instrument cluster worked fine though. If you pull the cover off the passenger side (as shown in the pics), and splice wires off of the connecter going to the VSS Buffer box and run the Purple (PPL) to BB9 (VSS Low) and the Yellow (YEL) to BB10 (VSS High), you will have proper speedo operation for the ECM... Easy enough since the buffer box is right there..
Last edited by thirdgen88; 03-26-2005 at 05:43 PM. Last edited by thirdgen88; 03-25-2005 at 12:44 AM. i have my intake and my Injector harness and my 7730 ecm. all i have to get is a fuel rail and injectors and fuel pump and filter.will the connectors off of my 92 TBI harness Plug into the 7730 or do i need to order the connectors also. my car is a 1992 L03. You need to get a few more ECM connectors from a junk yard or some other place. As for the Speedo issue. The way that you did it works since the VSS puts out 4000 ppm (what the 7730 ECM needs) where as the VSS Buffer only sends 2000 ppm to the ECM (what the TBI puter needs and the 165 ECM). All I did was flip the switch in TunerPro from Mag VSS to Optical and that made the speedo work. Last edited by Kat; 03-26-2005 at 05:03 PM. Ok I have read this thread twice.. and I must say I discovered that I am retarded.. So let me try to answer my question like this.. hypothetically.. I bought a TPI converstion off ebay.. tuneport intake, harness, computer.. the first question is, if I do it that way do I need to make sure its a speed density car or since I wont be using the computer, just the chip, does it not matter what year the tunport setup is off of?? Until I get my answer on that question I will keep things easy and say its a speed density setup.. I switched the fuel pump, installed the tuneport intake, and connected the fuel lines.. I unplugged my old computer and set it aside.. so now I am looking at X number of plugs and the new computer that came with the speed density tuneport set up with emply plugs attached to it (took all the wires out of the plugs of the new computer).. which diagram would I need, to know which wires to pull out of the plugs and move them to whereever.. I get the idea.. but on the charts listed in this thread there are several that are either blank, or have a (*).. what I would think would be extremely helpful is if somone could explain it for the retards out there like myself kinda like this.. take wire X from pin X and move it pin X on the new connector.. then take wire X from pin X and move it to pin X on the new connector.. and so on, and so on... I know it would be alot of trouble for someone to write that up but it would make it so that a 2 year old could do this.. (myself) LOL.. I was totally conviced I was going carb until I found this thread.. now if I can get it to make sense in my head and be as easy as you all make it sound I will definatly go with the tuneport.. Someone sent me an AWESOME wiring diagram and I replied to their email.. I am just going to copy and paste what I replied to him since it works here also.. What he sent me was diagrams showing exactly what wire goes where on the V6 and TPI computers.. basically what the diagrams showed me is that if I had a 350 TPI car from factory I would know exactly what each wire was for, where it was supposed to be and all that.. I still need to know which wires from the orginal TBI harness goes into which holes on the new 7730 connectors. This is the email I sent him..
Last edited by WhiteGhost; 04-06-2005 at 05:41 PM. Here's a visual of the pin locations and how you find the pin you're looking for. I would go thru and label all the wires on your harness with tape so you don't get lost. Its work but it helps. This picture is of the 7730 ECM plugs. I have also found that a service manual helps alot as a reference between the two ECMs, and the differences between the VIN E and 8/F harnesses. Any other pics you need I will try to post. I have a 92 RS 305 with T-5 and I am switching to HSR and 7730. I can take pics of the pages in the GM service manual if you like also for more of a visual. Let me know if I can help. By the way you have mail! I haven't really been keeping up on this thread, just read it for the first time in months this morning. It turned out my problem was not wiring related. Both pin E and pin M will provide the aldl data as I later found out. Also, I ended up fixing the vss to the ecm problem (ecm wasn't getting a vss signal), by switching the Mag vs. Opt Vss bit in the memcal. I have the vss wired in on pin BC6. That way, I didn't have to mess with the vss buffer box. Its still in place, and so is my Dakota Digital SGI-5 box for my 6 spd. I haven't touched any of that at all. Its been a while since I did the harness conversion, and I have to admit I was expecting to find some wiring screwups on my part. To this day, everything is functioning as it should. Of the problems I have come across, none so far have been wiring problems. I highly recommend this to anyone looking to do a TBI to TPI conversion. Of the problems I have come across, none so far have been wiring problems. I highly recommend this to anyone looking to do a TBI to TPI conversion. Agreed, this is definately the way to go from TBI to port injection (whether it be TPI, LT1 intake, or HSR)... Great procedure.. The feedback that we are getting from people who have done the conversion I think is making this procedure more and more refined... I'm thinking about doing a write-up on it this summer.. Thought I'd bring this up to the top again...I'm about to repin our 91 tbi 'bird to a 91 tpi. I don't quite uderstand the VSS issue what I would need to do on this part of the swap. I don't have the ability or knowlege to alter the prom so I would be using a stock 305 730 calibration. If I understand correctly the tbi uses a 2000 pulse and I need to change to a 4000 pulse for the tpi. Can I do this as pictured in an earlier post. Yeah, the procedure I listed was even performed on a '91 TBI bird... That will work just fine for you, and you won't have to alter the PROM. I just read this whole thread and it helped me out alot. I have an 87 305 TPI MAF setup. the intake is on and all that, just doin wiring now. Now this setup is going into a coughS10cough. If i do this repinning stuff and make it a SD setup will it run funny with my cam. I don't have the numbers by me, but i put in a 214/443 hydraulic cam (84 block) the camaro had a mechincal speedo, my s10 has an electrical? What do i have to do to make that work. And with the injector wires, I have the harness off the camaro, so i can pull those injector wires and the iat (sensor on bottom of upper plentum right?) and just feed those into my TBI harness right. then change my knock sensor. My TBI had an engine driven fan, and the camaro had dual electric fans. Will i have a problem if the compter sees that those arn't hooked up? Thanks for any advice you guys have. - I don't know what the previous ower did, but there a wires spliced and cut and everything else in the MAF portion of the harness so I have deceided to go to speed density. It'll probally be easier on me anyway. 1) Just to vairify in the chart on the first page. I has 2 columns, 730 and 747, the 730 colum has BA11 Fuel pump relay and the 747 coulum has A1, that means i have to move the wire in A1 to A11 right? 2) Will the TBI ECM connectors fit the 730 ECM and all i have to do is get the Green Eand F connector and move the wires over listed in the chart? 3) I went ahead and picked up some Flex a lite 210 e-fans and they come with there own switch will it be ok if the computer sees the fans arn't there or will it always act like it's hot or cold? 4) I'm gonna purchase some aftermarket gauges, now can i just buy a mechcanical spedo or does it have to be electric. My truck has an electric speedo from the factory, but it took a dump on me, don't know if it's the gauge itself or what. I replaced the sensor in the trans, and that didn't do anything. I would rather put in a mechcanical if i can. Sorry for all the questions, figured i ask them all at once any help would be greatly appreciated. 1) Yup, make sure to double check each pin movement so you don't lose track or make any mistakes that will take a lot of time to trace down later. 2) Yup, you just need the 3rd additional connector. However, you should get an entire set of '730 connecters, that way you can move the pins from your old harness to the new one without having to reuse the connecters (potential confusion source). Make sure to keep track of which one is the old connecter (sounds funny, but I made that mistake a couple times (caught it thankfully) when I was halfway through the procedure). 3) The ECM won't care if there isn't a fan connected to the pins. You might consider having the ECM trigger the relays, this way you can control the on temps much more closely than with the mechanical switches. 4) The '730 will need an electronic VSS signal. You might look at the VSS box that I mentioned a few posts back. 1) Is the TBI and TPI map sensor the same? 4) Last question, my vss, what do you recommond it do? Should i get electronic speedo it comes with senders too (http://www.autometer.com/cat_accesso...st.aspx?pid=28) which one should i get, can i wire it into my stock vss? my speedo wasn't working though when i parked it.